UFC's countdown preview for a coming fight returns before the year ends. This time it will be the countdown for UFC:125 Resolution. The countdown special will air on Spike TV on Dec. 29. UFC 125 will take place on Jan. 1 at the MGM Grand Garden Arena in Las Vegas with a Frankie Edgar vs. Gray Maynard lightweight title fight and Chris Leben vs. Brian Stann, co-headliner. The preview show debuts at 11:30 p.m. ET/PT on Spike TV. Replays are set for Dec. 31 (9 a.m. ET/PT) and Jan. 1 (6 p.m. ET/PT) on Spike TV and Dec. 30 (8 p.m. ET/5 p.m. PT and midnight ET/9 p.m. PT) on Versus. The “Countdown” show will focus on the co-headliners. With Edgar and Maynard, the UFC Fight Night 13 bout way back in 2008 will be the main topic. Maynard used his wrestling skills to score unanimous-decision victory in the event’s co-headliner. Maynard remained undefeated with five addition UFC victories while Edgar went on to win the UFC title from B.J. Penn. The two now rematch, and barring a rubber match or third booking, the winner is slated to fight WEC lightweight champ Anthony Pettis in a title-unification bout in 2011. 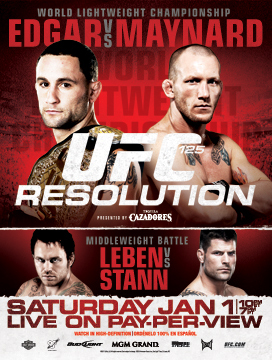 Leben, on the other hand, went 2-4 in a disastrous six-fight skid a little more than a year ago. He rebounded with wins over Jay Silva, Aaron Simpson and Yoshihiro Akiyama. Now, he is set to meet Stann, former WEC light-heavyweight champion, who won three of his past four fights, all in the UFC.